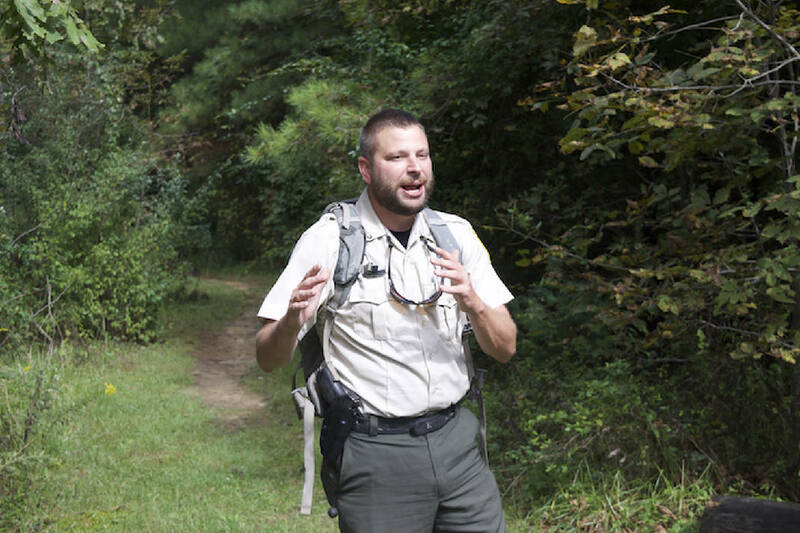 Staff photo by Mark Pace/Chattanooga Times Free Press — Park ranger Anthony Jones gives instruction prior to the first public hike on the Soak Creek Trail. The trail is the newest section of the Cumberland Trail system. Spring City, Tennessee — A new section of the Cumberland Trail opened Saturday in tandem with a wide-ranging celebration commemorating Tennessee's most recently named scenic river and the 50th anniversary of the National Wild & Scenic River Act. The new 7-mile one-way Soak Creek Trail was unveiled along the banks of the creek bearing the same name. The event was held in conjunction with gatherings across the state at each of the 15 designated scenic rivers to honor the legislation crucial to protecting the waterways. "Soak Creek will be the main part of this trail," Cumberland Trail park ranger Anthony Jones said. "We wanted to design it — as [park manager] Bob [Fulcher] has said — where we could feel the river. That's what we wanted to do." The trail has access atop Walden's Ridge along Shut in Gap Road at the Piney Falls Access area and another access point at the bottom of the gorge along Soak Creek. It offers views of the gorge in the forested area and a hike that meanders along the stream carved through the Tennessee Valley. The trail connects with the 10-mile Piney River section of the Cumberland Trail to the south and the soon-to-be constructed Hinch Mountain Trail to the north. The entire Cumberland Trail system stretches roughly 300 miles and is about 80 percent complete. More than 50 guests, elected officials and state workers attended the trail opening, eager to participate in the first public hike on the trail. In attendance was Tazewell, Tennessee resident Rosie Hopkins. The 61-year-old avid hiker has traversed every completed mile of the Cumberland Trail. "I love hiking. My best hike was over at Devil's Racetrack [in Campbell County]," she said. "This is really great. I just hope the water is flowing good, and I can't wait to get to the falls." The trail was designed by the state and built by contractor Cumberland Trail Conference. The project was made possible by a land donation from George Lindemann, Jr. The son of the former billionaire businessman lives in Miami, Florida but owns a home in the area. He frequently visits to enjoy Tennessee's scenic beauty and renowned paddling. He has made it his goal to help protect the Tennessee watershed. Lindemann, Jr. funded and led a coalition to make the creek a scenic river — the first new designation in 15 years. His 1,000-acre donation allowed for the permanent conservation of the creek. As part of the deal, he asked that spaced be developed for public access, according to his publicist. "I paddle here and was blown away that this level of nature still exists so near to civilization," Lindemann Jr. said. "I was moved to do the right thing."